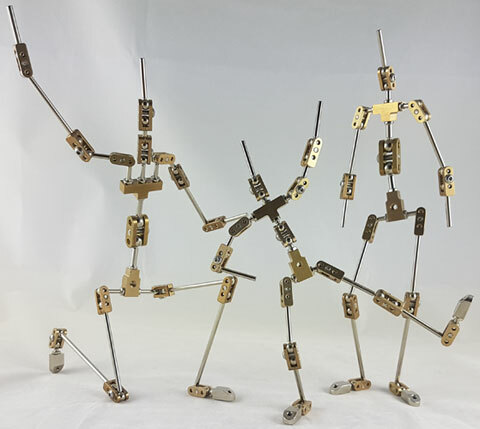 Stop Motion Animation Armature manufacture and design for Professionals, Students and Home Animators | Malvern Armatures | Contact Us. Office hours are Monday to Friday 9am to 6pm. You can email anytime and we will try to reply within 24 hours. Paul T. UK - I have received my armatures and just wanted to say how impressed i am with the quality for such a good price. I've worked in the industry for 10 years and they seem as good as any I've worked with before. Antonia R. Germany - My armature arrived today and I am so happy with the outcome. Thank you, I will definitely get in touch with you again in the future. Mike R. California, USA - I picked up the armatures today, they are exquisite, thank you. Jenny H. Glendale, USA - The armature has arrived - in good time and good condition. I’ve been doing tests with it, and am very pleased. OK, I have been having a ton of fun shooting tests with it. I will be shopping with you guys again. Albert M-M. Jetzendorf, Germany - The Tiger Armature arrived today. It's a piece of art. Thank you for the fast delivery. Josh F. San Francisco, USA - I always enjoy using your armatures in my films and music videos. Thanks for such a great product! Lewis B. Redditch, UK - I just wanted to say that I received my armature a few weeks back. I've been working with it for a while now and I'm very impressed with the quality and ease of use. Very happy customer - I'll be returning soon! Alison R. Massachusetts, USA - I just picked up the package and it (an Elephant Armature) is honestly one of the most beautiful things I have ever seen. Thank you so much for all of your help, your craftsmanship, and your speed - all are remarkable and as a result I might actually graduate now! Lucy M. Bournemouth, UK - I've been using your armature non stop since and it's perfect, thanks very much for all the help and instructions, we really appreciated it. I will make sure to come back if I need anything in the future. Geoff G. Houston, USA - Armature arrived and my son was delighted with it as was I. Fantastic craftsmanship. Emily W. Surrey, UK - "Just to say a massive thank you for the armature! It arrived in good time and we are absolutely thrilled! She moves like a dream!" Angus L. Glasgow, UK - "Needed to get the word around about your products. The armatures are works of art!" Raph R. Sydney, Australia - "We LOVE the armatures! Wonderfully constructed and superior to others I have used." Neil W. Preston, UK- "Great product, excellent service. Many thanks"
Alba G. New York, USA (Fantasiation) - "Your armatures are amazing. They move like a Rolls Royce"
Alba G. New York, USA (Fantasiation) - "The way your armatures move are amazing. I appreciate your craftsmanship!" Hiram R. California, USA - "Great - amazing service you have"
Alba G. New York, USA (Fantasiation) - "I got them so fast. Already did some tests and they are AWESOME!!. WOW - Thank You"